I am not one of those people that wants to grow old gracefully. If there is a way to stay young, I want to find it. For years, I’ve used skin moisturizers that claim to reduce wrinkles. I think it’s been pretty successful because I don’t think I really look 45. I’m kind of cheap, so I’ve stuck with brands that can be found at the grocery store. The morning my beautiful niece was born, we were watching the Cindy Crawford Meaningful Beauty infomercial and they mentioned that it helped with Rosacea. My husband has that pretty bad, so I thought I’d order it for him. I figured I could try it too, but it was mostly for him. Since there is more than one step involved in this beauty system, my husband bailed on it, but I have kept with it. I am happy to report that one of my biggest lines is barely noticeable anymore. I’ve been using Meaningful Beauty for almost a year now, and I really like it. As an added bonus, it’s really not very expensive. They’ll try to up-sell you, but you can tell them no. I did. Every once in a while they send you a free gift, too. 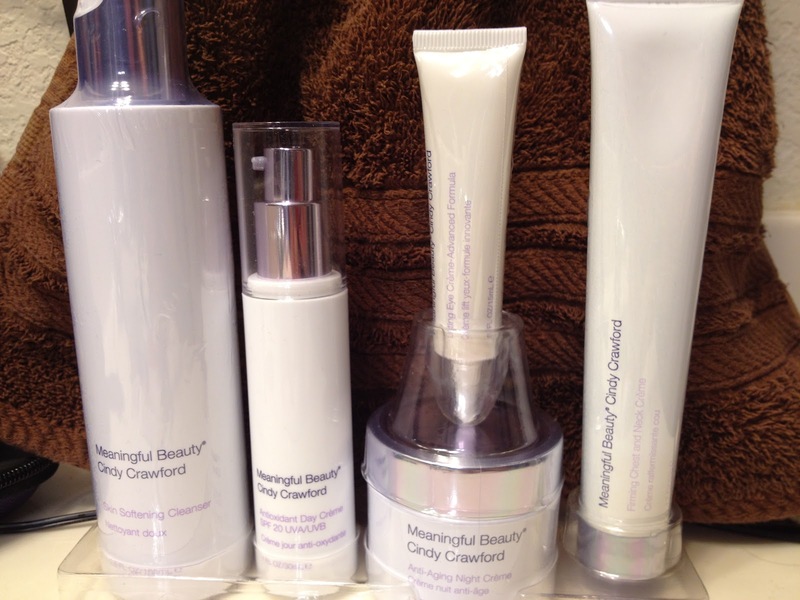 I would recommend Meaningful Beauty to anyone! Good to know! I have been thinking about using this for a long time, I just may have to give it a whirl!! !